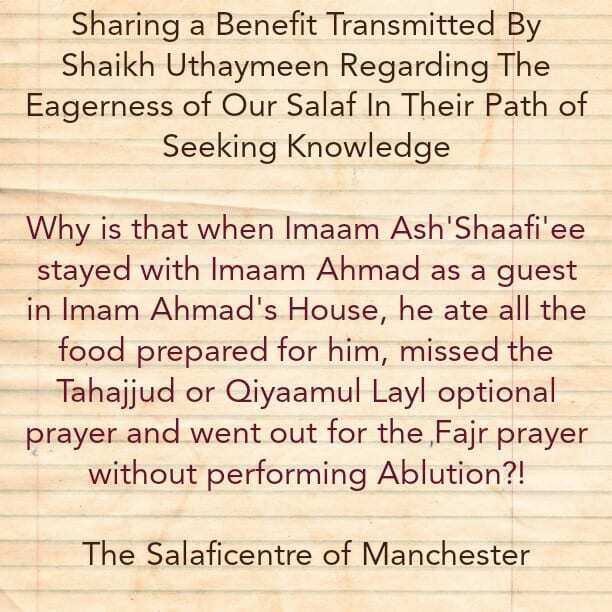 Shaikh Uthaymeen [rahimahullaah] stated in Sharh Hilyatil Taalibil Ilm pages 192-193 that it has been reported that Imaam Ash’Shaafi’ee [rahimahullaah] arrived as a guest of Imaam Ahmad ibn Hanbal [rahimahullaah]. Imaam Ahmad was a student of Imaam Ash’Shaafi’ee and used to be one mentioned with praise to the family of Imaam Ahmad. When Imaam Ash’Shaafi’ee came as a guest, Imaam Ahmad presented supper to him, so he ate all of it and the plate was returned empty. Imaam Ahmad’s family were amazed that Imaam Ash’Shaafi’ee ate all the food because the sunnah establishes that a person should eat little based on the hadeeth: ‘’It is enough for the son of Adam to eat a few mouthfuls to keep him going, but if he must [fill his stomach], then one third for his food, one third for his drink and one third for air.” Then Imaam Ahmad went to his family [i.e. after spending time with Shaafi’ee] and Imaam Ash’Shaafi’ee also went to sleep. When the last third of the night approached, Imaam Ash’Shaafi’ee did not pray Tahajjud. And when the A’dhaan of Fajr was called, he went out for Salaah without asking for water to perform ablution. In the morning, Imaam Ahmad’s family said to him, ‘’How can you say about Ash’Shaafi’ee what you [usually] say [i.e. praise]- the man ate the food and filled his stomach, slept and woke up without performing ablution?” So Imaam Ahmad said to his family, “I will bring you the news [i.e. the response regarding what you’ve asked]. Imaam Ahmad then asked Imaam Ash’Shaafi’ee, so Imaam Ash-Shaafi’ee said, “As for the food, I have not found food that is more lawful than Ahmad’s food, so I wanted to fill my stomach with it. And there is no harm if a person fills his stomach sometimes [i.e. eats to his fill or more than what is sufficient], because the Messenger [sallal-laahu-alayhi-wasallam] said to Abu Hurairah [radiyallaahu-anhu], ‘’Drink [more of the] milk’’ and he [Abu Hurairah] said, ‘’I cannot find [a space for it in my stomach].’’ As for the fact that I did not pray Tahajjud, then that is because I was examining something related to knowledge [i.e. to obtain a clear understanding of it] and that is more virtuous than Tahajjud. I was examining the Hadeeth in which the prophet said, ‘’O father of Umair! What did An-Nughair (a kind of bird) do (rhyming the words ‘Umair’ and ‘Nughair’)’’; and I derived more than a thousand beneficial points from it. 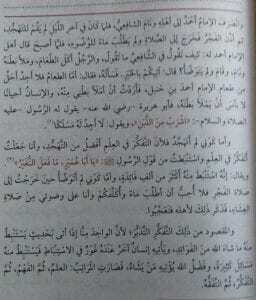 As for the fact that I did not perform ablution when I went out for Fajr prayer, that is because I did not want to ask for water and thus place you in difficulty and I was still in a state of ablution since after the Ishaa prayer.” Imaam Ahmad then related -to his family- what Imaam Ash’Shaafi’ee said and they were amazed.